Bruce is no longer on a ventilator. He's swimming and eating well. This is an update for the post from December 17. The loggerhead turtle that was on a ventilator has turned the corner and is doing pretty well. We have named him Bruce. He is now happily swimming under water. He has just recently become strong enough to stay in the pool 24 hours per day. He is quite hungry and is eating well. We are treating him with antibiotics and several other drugs to protect his digestive system. For the first few days after he arrived here he was passing foul-smelling, decomposing tissue from his digestive system. We think the medications are working well and we are hoping that his digestive system will be able to heal. We have recently sent several of our loggerhead turtles (including the featured blog turtles Santa and Jupiter) to the Riverhead Foundation, Long Island, New York for further rehabilitation. More updates will follow soon. After getting two big snow storms last weekend, followed by very cold temperatures, we thought that we probably would not be getting any additional stranded turtles for 2008. Usually, once the snow, ice, and freezing temperatures arrive any turtles that are left in Cape Cod Bay die from severe hypothermia. 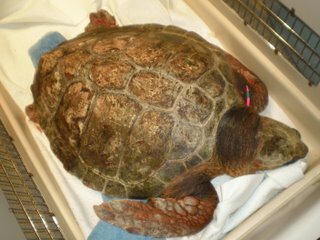 Imagine our surprise when we heard that a live loggerhead turtle had been found stranded on Cape Cod on Sunday December 21! 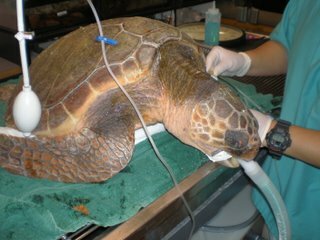 The turtle was brought to the New England Aquarium on December 22, and is receiving medical care. He is not yet warm enough or strong enough to be swimming very much, but he should be getting stronger over the next few days. The picture shows him resting in a nice padded bed of blankets and towels. Our staff named him Santa. 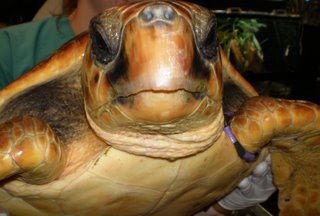 The loggerhead turtles that tend to strand in New England are juveniles that are much larger than the juvenile Kemp's ridley turtles that also strand on Cape Cod. We think that the larger body size of the loggerheads allows them to tolerate colder temperatures than the smaller Kemp's ridley turtles. 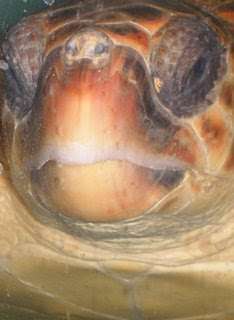 As a result, we usually see the largest loggerheads near the end of the stranding season, and the smallest ridleys at the beginning of the stranding season. This is Jupiter, a juvenile loggerhead turtle that arrived to our hospital on December 5th. Jupiter weighs about 25 pounds. It's hard for us to tell whether juvenile turtles are male or female. Both sexes look the same when they are young. As males get older they develop much larger tails than females. If we want to know the gender of young turtles we have to look inside their body (under anesthesia!) with an endoscope to see whether they have testes or ovaries. Jupiter was very cold when he arrived here, so he was gradually warmed, and was allowed to swim for short periods of time. This week Jupiter has been able to swim 24 hrs per day, and he just started eating a few days ago. His favorite foods are herring and squid. 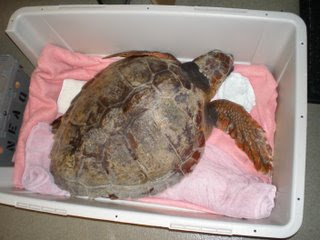 This loggerhead turtle arrived today with a body temperature of 48 degrees. He was found on a beach in Truro, Mass. He was near death, with a heart rate of only three beats every two minutes. He was not breathing. This photo shows him attached to a ventilator to help him breathe. We also gave him intravenous drugs to stimulate his heart and breathing. After several hours on the ventilator he perked up a little, and we were able to remove his breathing tube. His heart rate is now 5 beats per minute. He does not yet have a name, but his ID number is MH08-198-Cc. I will keep you informed of his status over the next few days. This photo shows a radiograph (x-ray image) of one of our cold-stunned Kemp's ridley turtles. His name is Casper, and he was admitted to the hospital after being found stranded on a Cape Cod beach. He has been here for about two weeks. His initial x-rays showed that his digestive tract was not functioning normally, so we are now doing a "contrast study." We used a feeding tube to introduce a liquid called barium into his esophagus. The barium shows up as a bright white area on radiographs, so we can follow the barium over time as it travels through his digestive system. This image shows the barium in the C-shaped part of his stomach. We are hoping that the barium moves all the way through his system and is eventually expelled. This will tell us that he does not have a blockage or other serious problems. Godzilla is ready for transport. This is Godzilla the loggerhead sea turtle. He is one of our larger turtle patients for 2008. He was found cold-stunned on a Cape Cod beach in November. He is about two feet long, and weighs nearly 60 pounds. During his time at the New England Aquarium he had blood tests, x-rays, electrolyte injections and antibiotics. We gradually warmed him up to 75 degrees, and he is doing well. After we stabilize turtle patients at the Aquarium we sometimes send them to other sea turtle hospitals to complete their rehabilitation. This picture shows him in a kennel crate, padded with towels for a car ride to another hospital. He will hopefully be released from Cape Cod in the summer of 2009. 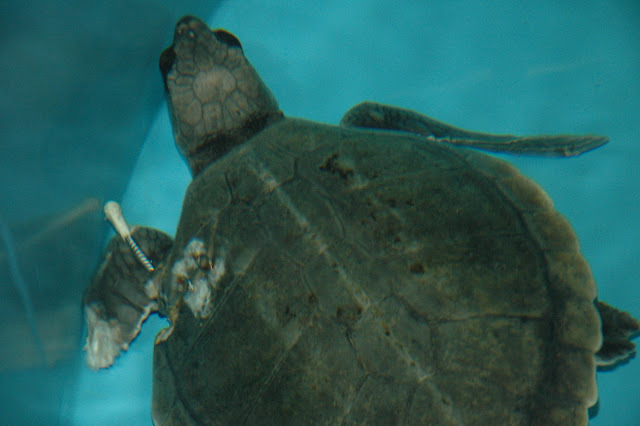 This juvenile Kemp's ridley turtle arrived at the New England Aquarium in October 2008. We named him Route. We don't know exactly what caused his injury. Several areas of his shell were broken, he had a large wound on his left shoulder and left front flipper, and a broken left humerus (the bone between the shoulder and the elbow). He had lost a lot of blood and was very anemic. He had orthopedic surgery to stabilize the humerus. In the picture you can see one of the metal bars that is keeping the bone in place until it heals. You can also see some wires that are holding the broken shell together. Unfortunately, the injury damaged the blood supply to the end of his flipper and some of it had to be amputated. Since we know that sea turtles in the wild can survive with only one front flipper, we are still hopeful that Route can be released in the summer of 2009. I will keep you informed of his condition.